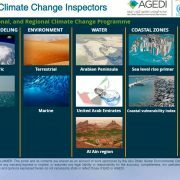 We are extremely pleased to announce that the executive summaries, sea level rise primer and the companion briefings are now all available online through the AGEDI LNRCCP Inspectors! We hope that you continue to find great value in our Inspectors with all the project data outputs, models, visualisations, animations, maps etc available freely to you. We are very pleased to now also share the photos from the symposium. Click here! We are very pleased to share all the recordings of the presentations of the experts during the symposiums three days, the panel sessions, their presentations as well as the posters made available. Please don’t forget to also visit the Inspectors Site for all the webinar recordings, technical documents, models, tools, output and input data, visualisations and animations available from each of the 12 sub-projects. We are very pleased to share our Principle Investigators publication released on the findings from our Abu Dhabi Blue Carbon demonstration phase. Congratulations to the team! 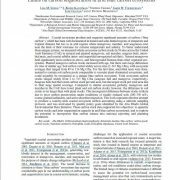 Abstract “Blue Carbon” initiatives have highlighted the significant role of seagrasses in organic carbon (Corg) burial and sequestration. However, global databases on the extent of Cstocks in seagrass ecosystems are largely comprised of studies conducted in monospecific beds from a limited number of regions, thus potentially biasing global estimates. To better characterize carbon stocks in seagrass beds of varying structure and composition, and to further expand the current “Blue Carbon” database to under-represented regions, we evaluate the extent of Corg stocks in the relatively undocumented seagrass meadows of the Arabian Gulf. Surveys were conducted along the coast of Abu Dhabi (UAE) and encompassed sites ranging from sheltered embayments to offshore islands. Seagrass beds consisted of Halodule uninervis, Halophila ovalis and Halophila stipulacea.While seagrasses were widely distributed along the coast, both living and soil Corg stores were relatively modest on an areal basis. Total seagrass biomass ranged from 0.03 to 1.13 Mg C ha−1, with a mean of 0.4±0.1 (±SEM), and soil Corg stocks (as estimated over the top meter) ranged from 1.9 to 109 Mg C ha−1, with a mean of 49.1±7.0 (±SEM). However, owing to the expansive distribution of seagrasses in the Arabian Gulf, seagrass “Blue Carbon” stocks were large, with 400 Gg C stored in living seagrass biomass and 49.1 Tg C stored in soils. Thus, despite low Corg stores for any given location, the overall contribution of seagrass beds to carbon storage are relatively large given their extensive coverage. This research adds to a growing global dataset on carbon stocks and further demonstrates that even seagrass beds dominated by small-bodied species function to store carbon in coastal environments. Don’t forget to also visit our UAE Blue Carbon Toolkit to interact with the data and findings. The tool has been designed to be simple to use and provide a rapid overview of the approximate total carbon stock value for a selected area of interest. This information is further broken down to provide information on the contribution of each ecosystem to the total carbon stock of the selected area. https://agedi.org/wp-content/uploads/2017/05/Capture-1.jpg 735 1267 Jane Glavan https://agedi.org/wp-content/uploads/2014/12/AGEDI-Logo86.png Jane Glavan2017-05-14 13:34:582017-05-24 10:51:38Another Publication now online! Publication on blue carbon for UAE now published! The AGEDI team is happy to share its latest publication on blue carbon storage in the UAE entitled “Limits on carbon sequestration in arid blue carbon ecosystems”. We believe that this publication details why coastal ecosystems are so valuable to protection of our shorelines as well as how we can support mitigation towards climate change. The technical reports are also available through our “for you” area of the website. https://agedi.org/wp-content/uploads/2017/04/Capture-6.jpg 769 579 Jane Glavan https://agedi.org/wp-content/uploads/2014/12/AGEDI-Logo86.png Jane Glavan2017-05-01 16:20:162017-05-01 16:20:16Publication on blue carbon for UAE now published!